Moloaa Bay is one of the most private bays on the island. There is fun for all ages on the exposed reefs and tidepools, the sandy beaches, snorkeling, surfing, kayaking, swimming, fishing, or roasting marshmallows on a fire at the beach when you are not picking fresh fruit or flowers and just want a rest. There is shade at the beach (large trees), for those with fair skin and protected areas for small children. Large bedrooms with beautiful, rare, hardwood floors and imported handmade rugs and hand-carved teak accent furniture make this 'fruit and flower picking' an experience to talk about for a lifetime. You will have an experience like never before while staying in this 'farmers market buffet' plantation. It is Very Private and out of view. Close to town, shopping, movies, restaurants, etc. I am the daughter of the owner and manage the property. My father built the home and I have been traveling there for 22 years multiple times a year. I love Kauai and Moloaa is a peace of heaven for me. Woodrose Plantation has become a part of my family. I have 5 children and have been married for 26 years. We vacation here every summer for a month or more. This is truly a home away from home. The very private location situated on high ground above the flood and tsunami zones yet close to the bay was paramount. Large beautifully landscaped property with many fruit trees for our use combined with rare and beautiful Plantation Architecture and modern amenities yet green and clean is rare. Proximity to beach and ocean yet enough distance to be safe for families with small children is also hard to find. Sufficient distance from noisy pounding surf in winter yet close enough to feel fresh breezes and hear ocean music requires the perfect distance to beach. Privacy of this Beach makes it safer and devoid of crowds with trees for shade when we've had enough sun. Moloaa is unique in that it is located in a banana belt and when it is raining in Princeville it is often still sunny in our little bay. We are in a semi-private bay and there is not much parking which makes it less crowded. We have many fruits and a great road to run or bike or walk up to the fruit stand. You can pick wild strawberry guava and passion fruit on your way. Moloaa is truly unlike any other place I have been and if you like to be away from the business of life this is a wonderful place to come. Very nice stainless stove and oven. Beautifully fully appointed modern kitchen with granite country tops, stainless appliances, and everything necessary for a full family to cook and eat and live in luxury. Beautiful hardwood dinning table and 6 custom hi back hardwood chairs. Our stay at Woodrose Plantation was great. We really enjoyed staying at Woodrose. The house is spacious, comfortable, and well suited for a group of adulls or a family. The location is secluded but not far from attactions and access to essentials. The beach is nice and there lots of other nearby beaches to visit. We would consider Woodrose for another family vacation. We stayed at the house for 8 days / 7 nights. The house was big enough for 2 families to stay and be comfortable. The only reason I'm not giving it 5 stars is for a few minor suggestions on items that need replacing. So really, I'm giving it 4.5 stars. Kitchen was well stocked with pots, pans and utensils, pretty much anything you needed! No complaints with the kitchen at all. The bedrooms were good sized and accommodated our needs. Beds were mostly comfy but they are in desperate need of new pillows and sheets for all the beds. We also had a hard time finding extra linens for the fold out beds. I was only able to find one full set of sheets for 1 of the 2 pull out couches. There are 3 bathrooms in the house and they served every ones needs. With 2 families that have teenagers, bathrooms can be an issue if there are not enough. There seemed to be a shortage on towels, so we were constantly washing towels. The showers could also use some new shower curtains. The main bathrooms curtain is too small and the water would leak out the shower no matter which way you adjusted it. And the other bathrooms have some minor mold on the liners. If they replaced these the bathrooms would be perfect. Tiffany, the owner was super responsive if we had any questions or couldn't find anything. The location is amazing. It's a short walk to almost private beach. The house had some snorkeling gear which was great! They also had some folding chairs for those people who don't like to lay on the sand. All in all, we had a great vacation and would recommend this house for people looking to stay on Kauai but not in the south region where all the resorts are. I am sorry about the towels. We supply a minimum of 8 towels (one per person) but there should have been a few extra. I will check with the cleaner. I have also messaged her about replacing the shower liners which do get mold quite quickly and we replace often. Since the house has a max of 8 people allowed we only have one set of sheets for one pull out couch leaving 3 king beds and a queen and a double pull out. I have never had anyone ask about that before I am sorry. I had just bought new pillows as well the end of February and from the sounds of it they didn't get put in the house by the cleaner. I have messaged her about it. Thank you for your suggestions and glad you had an enjoyable time. The plantation house was a dream. An abundance of fresh fruit at your fingertips. Walk to the amazing and almost private Moloaa beach. A perfect getaway spot for a family or group of friends. 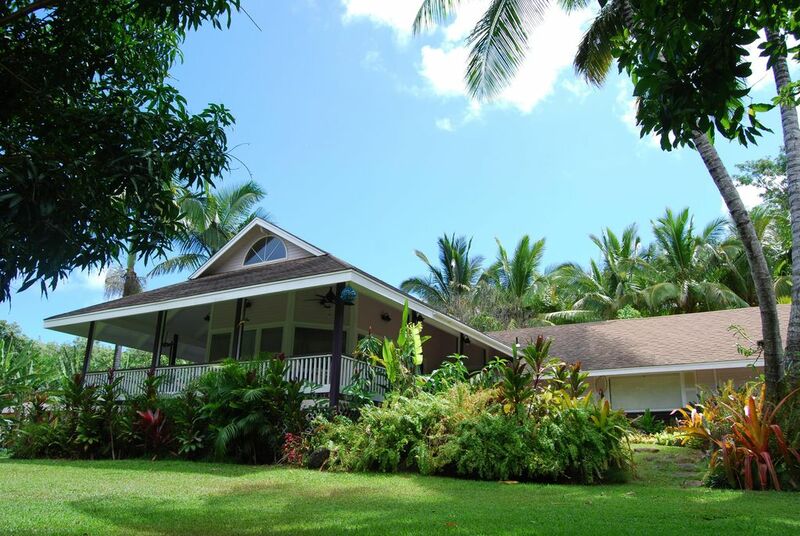 Lovely and comfortable home near the beautiful Moloa'a beach, good for surfing and fishing though not snorkeling, at least in the winter. Few people were at the beach during our stay. There's solar electrical that created some minor glitches, but the house is open and has a wonderful porch overlooking a large, secluded garden. Glad you were able to enjoy Woodrose Plantation. We are sorry about the solar water heater and have replaced it to solve the problems you experienced. We hope you can make it back to the bay when its summer and you are able to enjoy the snorkeling too:) Thank you for being wonderful guests! Bruce S.Where do you live? Our family (7 of us) stayed in this property for 10 days over the holidays and thoroughly enjoyed it. It's comfortable & well-supplied. Kind of an "old-Hawaii" feel, rather than shiny and glitzy. The 3 bathrooms were appreciated. The large covered porch was a lovely respite during the frequent rains. It's close to a quiet, uncrowded beach. The property is in a good central location and is quiet and private. The large yard is very nice and would be a great place for kids to play safely (we were all adults). At our time, the citrus & avocado trees were producing good, edible fruits. (Be careful about parking your car under the avocado tree over the driveway.) The wifi was strong enough to handle 7 devices going at the same time in various locations. Communications with Tiffany were timely and useful. There were a few minor issues which I will tell Tiffany about, but they didn't detract from our wonderful visit. We'd gladly return. We booked this property for a family getaway and found it to be just what we needed. It's well located, especially for those who enjoy the north and east side of the island like we do. Plenty of room for 8 adults and we really enjoyed the grounds as well. This location felt very private to us. Jan 07-Dec 14 .. $275-$375/day ... $1950/week (up to four people). $100/week/person extra over four; NO more than eight please. Dec 15-Jan 06 . $2150/week (up to four people). Dec 15-Jan 06 .. $2350/week (four to eight people). Deposit of $500. Cleaning fee taken from the deposit is $325 min. Tax: 13.25% Note: Until confirmed, rates are subject to change without notice.